Nikon experimenting with Full Frame!? Looking at this picture, we think that Nikon is experimenting with a Full Frame sensor. As we all know, the crop factor is absent with the full frame sensor. So we need to compensate this with longer lenses. 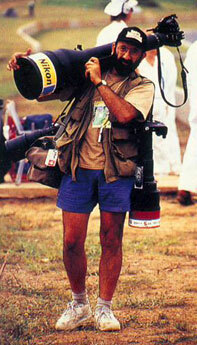 This guy is using “The Mother of all Zooms” — the MF Nikkor Super telephoto Zoom lens 1200-1700mm f/5.6~8.0s P ED IF. If he had used a DX sized sensor he could have got a way with something much lighter. Sorry to blow Your bubble Janco, but to me this camera looks very much like the very full frame 35mm film camera, Nikon F4. In a few days the Photokina 2006 will (maybe) reveal the next Pro Digital Nikon.